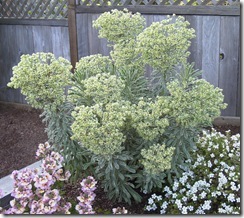 My favorite accents for a showy winter garden! Tassel Fern – This poor plant was given the botanical name of Polystichum polyblepharum – a mouthful by anyone’s standards. Fortunately its glossy fronds and graceful charm more than make up for the tongue-twister when we ask for it at the nursery! This 2-3’ beauty stays mostly evergreen, and you don’t have to cut it back each winter as you do our native Sword Fern (Polystichum munitum). 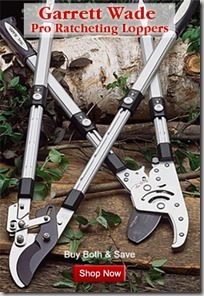 I love to use it with Black Mondo Grass and purple Violas, or with a variegated evergreen shrub as a backdrop. It’s great in containers, too! 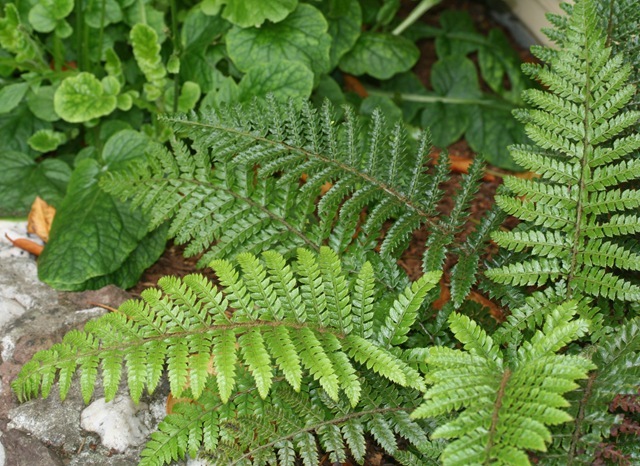 Alaskan Fern – Polystichum setiferum/ P. angulare is deceptively delicate- looking, with its wispy, light green fronds – but it’s hardy to zone four and is surprisingly tough – tolerating lousy soil and root competition in one local garden. It has a really interesting growth habit for a fern – each spring the old fronds bear new baby fronds along the middle section of each stem, so as it grows it becomes a feathery mound with little shoots here and there. New leaves also unfurl in the usual ferny fashion, with a pretty cinnamon brown color accenting them as they open. 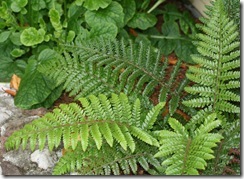 Alaskan Ferns stay green all winter and gets to 2-3’+ in time. All it really requires is regular water, but it also appreciates reasonably good drainage and a layer of mulch or compost. An added benefit to using ferns? I’ve never seen them eaten by deer. Helleborus orientalis – If you’ve been a gardener for a while, you’ve probably heard of Lenten Rose. Harry Potter fans will remember it was used in Harry’s failed Draught of Peace, but in fact it’s somewhat poisonous. That’s of little consequence to us – the leaves are so leathery it’s hard to imagine anyone willingly chomping it – the deer certainly don’t! This dignified 2-3’ plant has deep green foliage, each leaf the size of an open hand and divided in five. With blooms beginning in December and often going for months, this is a winter star you won’t want to miss. If you don’t want seedlings, trim off the blooming stems at the base when the flowers begin to lose color and swell at the center (after about 2 months), otherwise you’ll have a lot of slow-growing baby Hellebores coming up each year. 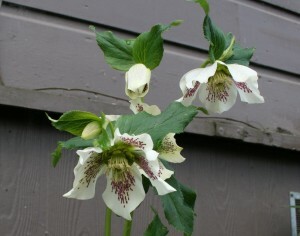 Most Hellebore hybrids are sold as a strain (a variety of seedlings which vary in color and form) – so unless it’s in bloom, you don’t know what color you’ll get. This is fine if you’ve chosen a premium strain, but not such a great gamble if you only have access to the common ‘Royal Heritage Strain’, which seems to produce just a few vivid shades mixed with a large proportion of muddy, dull pinks. ‘White Lady Spotted’ (pictured) has a lovely bright white flower with burgundy spots, ‘Red Lady’ is a rich reddish burgundy, ‘Double Queen’ is a strain of fluffy double flowers that look like little roses in winter, and ‘Brandywine Strain’ has some gorgeous apricots and yellows, prettily outlined petals, and a few ruffles thrown into the mix. Euphorbias – These alien-looking plants always get a second look in the garden for their pretty foliage and ginormous flowerheads (which are great as cut flowers). While they won’t be blooming for you in the winter, they are generally putting out a cluster of fresh new growth right now, which depending on the variety may be blue-toned, burgundy, or variegated. These undemanding sun-lovers prefer good drainage, but otherwise don’t ask much – and it’s great for deer-resistant gardens. My favorite Euphorb of the moment is ‘Glacier Blue’, a blue and cream variegated version which gets to 3’ and looks gorgeous with pinks and purples. 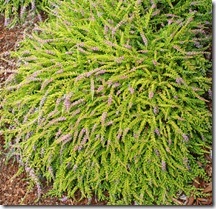 Scotch Heathers, or Calluna vulgaris, have many varieties with amazing winter color. They are evergreen sun-lovers, bloom mostly in mid-to late-summer, and have foliage that ranges from deep green, golden, velvety silver, to flaming reds and oranges. 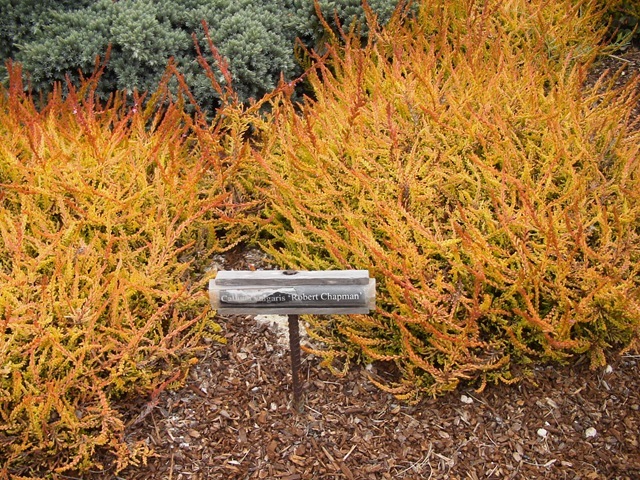 There are low groundcover types that stay flat to the ground, and more vigorous ones which get 2’ or more around. ‘Robert Chapman’ is a 1’ by 2’ Scotch Heather which is golden-orange most of the year, and with the cold goes a fiery reddish-orange. ‘Pat’s Gold’ is a lovely creeper with lavender flowers in midsummer, and a fresh limey gold foliage year-round. ‘Spring Cream’ is yet another favorite of mine, with bright cream-colored new growth in early spring and masses of white flowers later in the year. Scotch Heathers are strong, hardy, deer-resistant plants that only need trimming once a year, right after they bloom. I simply trim to right below each dead blossom in autumn, and they perform beautifully all year. One caveat? They’re particularly sensitive to repeated peeings-on by our canine friends, so site it where it won’t attract such attention and you’ll have an awesome low-maintenance performer. 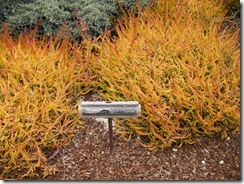 If you liked this post, check out this article on ornamental grasses for winter interest! I understand! Is it wrong to say I’m thinking about plant-based names for any little ones that may eventually come along? Perhaps I’d better stick to the latin and give them obscure names instead of Rosemary and Fern-type names! The Painted Fern is really pretty, but not evergreen and it is fairly delicate as ferns go – but in a container with other things, maybe it’d be OK for it not to have a long season of interest. 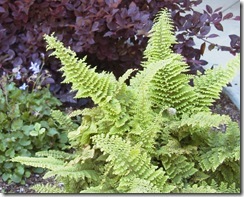 I did see a new variety with the ghostly painted fern colors but with a bright purple tinge to the new growth as well. It was stunning. Nice job with the photos. The ferns are especially lovely. 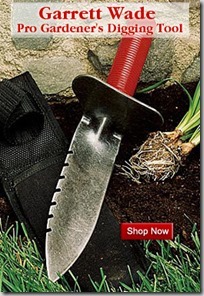 Looking forward to your post on ornamental grasses. How I envy your growing season! Thanks, Ann! I envy your bananas!!! The plants in the above site, to what zone are they winter hardy, please?